It amazes me how my kindergartners were learning to identify letters and sounds at the beginning of the school year, and now they are learning about words with specific phonics patterns. 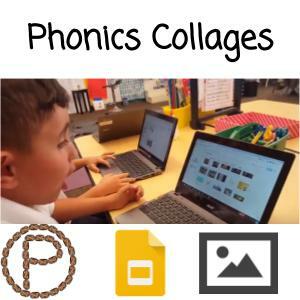 When learning a new phonics pattern the kids will read a book with the pattern, participate in a whole class brainstorm of words that have the pattern, apply what they know about the pattern in writing, and insert pictures on a Google Slide to create a collage. Below I complied a few students’ slides into one presentation. My kids are literally running to the board for a closer view of how to spell a word. The kids came up with the words on the whole class /ch/ brainstorm poster. When they went to their devices they chose which words they wanted to include on their slides. They had to type the word in the search engine. This is where spelling becomes meaningful to them, and learning these phonics patterns. We do not need to provide everything for the kids. As I write this post in May, I am putting less and less on my kids templates. I didn’t put pictures for them, text boxes, or drag-able anything for them to complete this activity. Raise that bar you have for the kids and believe that they can do MORE! When you grab a copy of the template, you will see all that I have on the slides are images that correspond to the phonics pattern. I always introduce a new phonics pattern with Heidi Songs “Sounds Fun Phonics” video. (To catch a glimpse of the sounds and motions, check out her YouTube video where she spirals through the sounds.) She has an image and a motion to go along with the phonics pattern sound. To keep the familiarity of the phonics patterns, I included similar images on the slides. 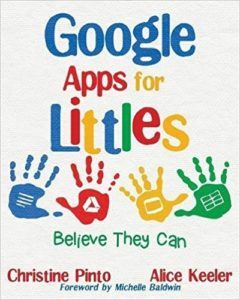 With this activity, the kids are using the image search engine within Google Slides. I have a blog post with some tips and observations of the kids when they were performing image searches. This activity is a work in progress, meaning the kids are continuously coming back to the slides as they learn a new phonics pattern. Since they are familiar with the activity, they hardly need my help even for troubleshooting. Their independence while working on this digital activity has given me the opportunity to have different conversations while they work, whether it be about the phonics pattern or even an idea with designing the collage. 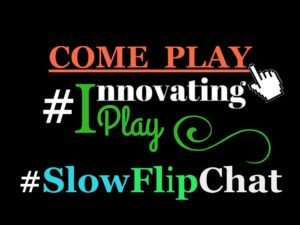 This entry was posted in Chromebook, ELA, Google Slides, Kindergarten, Template by Christine Pinto. Bookmark the permalink.